I managed to get this book early here in Singapore because apparently there are two publishers for the book. One's Basheer Graphic Books and the other is Quarry Books. Basheer distributes for Asia and the book is out in Asia first. The Urban Sketching Handbook: Architecture and Cityscapes is almost A5 size but smaller as in it it's more vertical. It's a paperback with 112 pages and comes with a rubber band to hold the covers together, like some sketchbooks do. Gabriel Campanario is a staff artist at The Seattle Times and also the founder of UrbanSketchers.org, an online community dedicated to location sketching. I've followed his personal blog as well as the Urban Sketchers blog for a long time and some of his work and those from other sketchers are included in this book. The drawing tips in the book are actually contributed by the guest artists including Gabriel Campanario himself. They are written in a concise manner, usually not more than three sentences. Each sketch also comes listed with the tools used. I can imagine that could be quite dangerous to the wallets of those who like to experiment with drawing tools. An important point to note is this is not a technical or in-depth book on architecture, or for that matter, a technical book on drawing with rules to follow. For example, it talks about vanishing points, and about buildings in perspective with the usual two vanishing points plus building example, but it does not go too much in detail and just focuses on common perspective problems people face. The basic foundation of observation drawing is understanding proportions, and while that is not explicitly taught, there are several tips based on proportion. Another example is that you can create depth using varying tonal values, but the exact techniques of creating those tonal values are not mentioned, and of course the technique will depend on your tool. 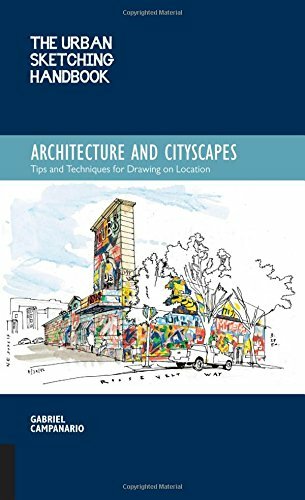 This is more like a book that compliments other drawing books, and here it focuses on drawing at urban spaces, the buildings and architecture. From page 77 onwards, there are galleries featuring pen, pencil, watercolour and mixed media works from other artists. The commentary are the artists' thoughts on using the tools and there are also some drawing tips. This book is for beginners who know basic drawing, and they can use the tips to improve their sketches in the different areas taught, namely composition, scale, depth, contrast, line and creativity. Overall, I wish the book could be more technical, but for the price it's still quite worth the purchase.